Two of the top running backs in the state will square off when No. 5 Olathe North travels to take on No. 4 Gardner-Edgerton. While most of the state knows about Gardner-Edgerton senior running back Traevohn Wrench, many may not have heard about Olathe North’s Venus Triplett. All Triplett has done is rush for 981 yards and 16 touchdowns in leading a young Eagle squad to a 5-2 mark. Olathe North’s two losses have come by a combined four points to Shawnee Mission South (10-7) and Shawnee Mission East (23-22). The Eagles also have a marquee win having knocked off then No. 1 Lawrence Free State 26-19 back in Week 5. In that game, Triplett rushed for more than 220 yards and three touchdowns. North also includes a dual-threat quarterback Cole Murphy who has rushed for 534 yards and six scores, but has thrown for nearly 900 yards and eight touchdowns. When Murphy looks to pass, junior tight-end Josh Moore (6-5, 250) is a match-up problem. Moore has already been offered by Texas Tech and sought after by several other BCS schools. On defense, TCU-commit Jimmie Swain leads an athletic group that will try and chase down Wrench. Wrench has rushed for 1,659 yards and 24 touchdowns this season. The continued development of three-year starter Jared Hobby at quarterback has helped Wrench’s efficiency. Hobby has thrown for 1,100 yards and 12 touchdowns this season. Last season, Gardner-Edgerton blasted the Eagles 59-28. Expect it to be much closer this time around. Holton and Topeka Hayden will meet one last time in district play in what has developed into a good annual barometer of what’s to come in the Class 4A playoffs. In consecutive weeks, Holton has soundly beaten opponents that have entered the match-up unbeaten. The Wildcats doubled-up Jefferson West 40-20 in Week 6 and last week opened district play with a 56-6 thrashing of previously unbeaten Wamego. The story for Holton continues to be the run game. The Wildcats are averaging 395 yards per game on the ground, including last week’s 584-yard performance against the Red Raiders. Senior Brenden Hampton leads the team with 862 yards and 12 touchdowns, while Drake Ewing has added 434 yards and ten scores. The Holton defense has been equally good having forced 13 turnovers and giving up less than nine points per game. Topeka Hayden enters the game with three losses by a combined 15 points. The Wildcats dropped consecutive games to Topeka High (25-20), Washburn Rural (21-18), and Junction City (28-21). Those three Class 6A opponents are a combined 16-5 heading into this week. The Wildcats are led by quarterback Jacob Head who has passed for 777 yards and eight touchdowns. He has added 116 more yards on the ground this season. Running backs JC Menke and Zach Smith lead the Hayden rushing attack. Menke leads the team with 787 yards rushing and average more than six yards per carry. Smith averages more than five yards per attempt and has totaled 427 yards on the season. When Head looks to throw, it’s often towards Jake Kresin who has 20 catches for 268 yards and four scores. Hayden beat Royal Valley 21-0 last week in a sloppy opening to district play. The Wildcat defense held the Panthers to only 70 yards of total offense. Hayden will need a similar defensive performance to slow down Holton. 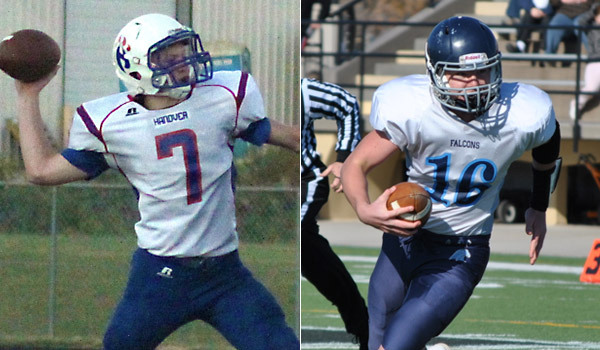 Hayden has won two of the past three meetings, but Holton was victorious 27-0 last season. The Crawford Neosho Cherokee League champion Columbus Titans will battle its former Southeast Kansas League foe Coffeyville for the lead in the Class 4A District 8 standings. Columbus is enjoying its best season in recent memory, earning its first 7-0 start since the Titans won their first 10 games before falling to Louisburg in the 1998 Class 4A quarterfinals. Both teams boast balanced offenses and a lot of athleticism. Columbus quarterbacks Nate Bole and Trey Robinson have combined for more than 1,000 yards passing. Jace McDown has rushed for 544 yards and seven touchdowns, while Zane Roark has run for 516 yards and five touchdowns. A.J. Randle has 22 catches for 487 yards and six touchdowns, while Javohn Morrill has 15 catches for 291 yards and two TDs. Coffeyville quarterback Nathan Finley has passed for more than 1,200 yards. LaDarrius Johnson has run for 867 yards with 16 touchdowns, while Destin Downing has 467 yards and 11 touchdowns. James Newton has 23 catches for 490 yards and four touchdowns, while Darron Deffebaugh has 15 catches for 489 yards and one touchdown. The Golden Tornado defeated Columbus 68-26 and won the district, while the Titans settled for runner-up. The Hi-Plains League rivals are all about pace. Meade has won two of the last three Class 2-1A state championships, including last season. The Buffs’ single-wing offense average 53.1 plays and 447 yards per game. Elkhart is the second fastest squad among the top-25 Kansas teams in total offense. The Wildcats’ blur offense averages 67 plays and 508 yards per game. Meade, though, ranks No. 1 in the classification in points (363) and fifth in defense (78). Elkhart has outscored teams 312-116 behind senior quarterback Alex Gomez, a four-year starter, who has passed for 1,572 yards, rushed for 769 yards and accounted for 34 scores. Senior wideout Juston Hurn has enjoyed a big year with 32 catches for 945 yards and 13 TDs. Meade senior quarterback Jett Little, formerly a running back, has completed 26 of 44 passes for 478 yards with a 12/3 TD/INT ratio. He has rushed 113 times for 839 yards and 21 TDs. Elkhart and Meade are both 2-0 in district play; a win clinches the district and a first round home playoff game. The loser likely travels to Oakley in the first round. Meade is 5-0 against Elkhart in the last decade. Meade is 37-0 in district games since 2004, according to maxpreps.com. Elkhart will push the Buffs well into the second half, but the Buffs have the size and experience in big games for the victory. Solomon again put up big numbers after they made the sub-state championship game last season and had the best finish in school history. The Gorillas have scored 420 points, second-best in Eight-Man, Division I behind Osborne (440). Solomon is one of seven undefeated teams left in the classification. Senior running back Mason Demars has 135 carries for 1,034 yards and 18 scores, while senior Mark Aylward has 110 carries for 796 yards and 16 TDs. Senior quarterback Colton Shirack has 21 carries for 42 yards with 305 yards and an 8/1 TD/INT and also rushed 57 times for 463 yards and 10 TDs. Central Plains is 2-0 against Solomon with a 54-6 victory in 2011 and a wild 56-52 win last season. Layne Bieberle returned two punts for scores and had 249 return yards in the victory last year. Bieberle has 338 return yards and 26 catches for 607 yards with 13 receiving scores this season. Sophomore Braeden Crites has thrown for 1,342 yards with a 22/4 TD/INT ratio. Central Plains’ only loss came 66-28 to Victoria in Week 5, the No. 6 offense in Eight-Man, Division II. Central Plains’ defense will struggle some again Solomon's high-octane offense Friday. Both teams are 3-0 in District 5 – the Gorillas clinch the district title. This is the last regular season matchup of the state’s premier eight-man rivalry in the last decade. B&B will close its doors and consolidate with Seneca-Nemaha Valley next season. The Falcons hold a 9-2 edge since 2003 and have won seven in a row in the series. Four of those meetings, including a 52-46 contest in the 2012 regular season, have been within 14 points. The teams met up in the Eight-Man, Division II sub-state title game last season and B&B won 50-20 en route to a state championship. After a Week 1 loss to Madison, the Falcons have won six straight. Senior quarterback Dustin Rottinghaus completed 71 of 119 of 1,229 yards with a 22/3 TD/INT ratio. No Falcon has more than 221 rushing yards. Hanover, paced by junior quarterback Andrew Bruna and senior Kent Bruna, have lost just once, a 22-6 Week 4 neutral site contest against No. 2 Sharon Springs-Wallace County. These are likely the top two teams on the east side again and could meet up in the sub-state title game for the third time in the last four years. This time, B&B has enough, especially offensively, to win its eighth straight in the series.